Thonjolf is a Nord citizen residing in Winterhold. He lives with Kraldar in the latter's house, where he sleeps from 10pm to 6am, then wanders around the house all day. Thonjolf wears a set of farm clothes along with a pair of boots. He wields an iron dagger and carries his key to the house along with a selection of common items and gold. When spoken to, Thonjolf will shed some light on his duties, and Kraldar's family history: "Kraldar's family was once very powerful in Winterhold. It's my honor to assist him even now." He will also speak of Kraldar's ambitious designs for the hold: "Kraldar has big plans for Winterhold. We'd be better off if he was in charge." Should the Imperial Legion take over Winterhold, Kraldar will replace the exiled Korir as jarl, and will keep Thonjolf by his side, no longer as a mere servant, but as his housecarl. He and Kraldar will move into the Jarl's Longhouse down the street, where he will hold court with Jarl Kraldar between 10am and 4pm, go to bed at 11pm and sleep until 6am, and he will return to Kraldar's old home whenever he has time. Due to the laziness of the steward, Malur Seloth, Thonjolf is forced to bear any responsibilities that Kraldar cannot take care of himself. He will comment on this, saying "I'm just the Housecarl. If you need something, you should speak to Kraldar." and "I'm very busy, you know. I'm the only one Kraldar can rely on to assist him." Despite Kraldar's tolerance of Malur Seloth, Thonjolf will reveal that he doesn't hold the steward in such high esteem: "I'm not one to complain, but I'm not sure why Kraldar insists on keeping Malur Seloth around." Ever diligent, Thonjolf will remark, regardless of whether he is housecarl or not, that: "Some people can't be trusted to accomplish anything that's asked of them. They don't take pride in their work." perhaps indicating why he dislikes Malur Seloth. 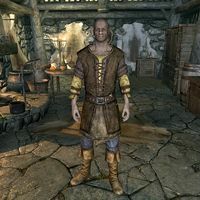 Should the Stormcloaks retake Winterhold after giving it away as a concession in a temporary truce, Thonjolf will enter exile with Kraldar, relocating across Skyrim to Erikur's House in Solitude, while Jarl Korir and his family will return from exile in Windhelm. Kraldar: "So, what's the latest exciting news about goings-on in Winterhold?" Thonjolf: "There is no news, I'm afraid." Kraldar: "None? Nothing at all? Nothing from the College, even?" Thonjolf: "I shall inform you the moment something noteworthy happens." Kraldar: "Yes, that'll be fine. Thank you." Thonjolf: "Will you be needing anything special today?" Kraldar: "Why don't you see if Arch-Mage Aren is interested in joining me for a meal?" Thonjolf: "Again? Are you sure? He still hasn't answered your last several requests." Kraldar: "Well, he's been very busy. Perhaps today he'll have some free time." Thonjolf: "Malur, I need you to take care of something." Malur: "No, I don't think so. Not today." Thonjolf: "I haven't even said what it is." As housecarl, Thonjolf will not sleep in the jarl's longhouse, and will instead go back to Kraldar's house to sleep. This bug is fixed by version 1.2.4 of the Unofficial Skyrim Patch. This page was last modified on 11 July 2015, at 14:59.